As part of a broad effort to end misleading wireless billing practices, the Federal Communications Commission is expected to offer a proposal today requiring cellphone companies to alert customers before they incur costly charges not covered by monthly plans. Under the proposal, wireless companies would have to notify customers through voice mail or text alerts that they are approaching or exceeding texting, voice, or data plan limits. Those traveling outside the United States would automatically be notified when they are subject to roaming charges. The FCC is accepting public comment on the proposal through its website, www.fcc.gov, and the five-member commission is expected to issue a ruling within 45 days. “We are here to serve the public, and we must ensure that consumers have the tools and information to make the market work and, when necessary, to challenge unfair business practices,’’ FCC chairman Julius Genachowski said yesterday in a speech at the Center for American Politics, a liberal think tank in Washington, D.C. The FCC identified “bill shock’’ as a problem last May, citing a Boston Globe story about Dover resident Bob St. Germain, a Verizon customer who received an $18,000 phone bill in 2006 for just six weeks of usage. St. Germain’s adult son, Bryan, racked up the charges by tethering his cellphone to a computer after the expiration of a two-year promotion that included free Internet access. Shortly after the FCC said it would take steps to prevent such billing nightmares, Verizon offered to forgive St. Germain’s bill. CTIA, a trade group representing the wireless industry, has lobbied against regulations aimed at stopping bill shock, saying providers already offer ways for consumers to check how many minutes they have used or how much data they have downloaded. Chris Guttman-McCabe, CTIA’s vice president of regulatory affairs, said in a statement yesterday that the Better Business Bureau has reported that the wireless industry has resolved 97 percent of customer concerns. AT&T declined to comment on the FCC proposal. Michael Murphy, a spokesman for Verizon Wireless, also did not comment but e-mailed a copy of Verizon’s user policy, which included information about how the company already provides text messages to customers who are at or nearing their voice, messaging, or data allowances. Sprint spokesman John Taylor said customers can press “*4’’ on their handset to get information about voice mail or text limits, and can access data usage details online. 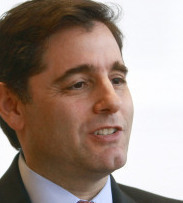 Genachowski, however, said those tools are not an industry norm and that problems for consumers persist. The FCC said it received 764 complaints about bill shock in the first half of the year. Sixty-seven percent of the complaints were for bills at least $100 higher than anticipated, and 20 percent involved unexpected charges of $1,000 or more. One complaint involved a $68,505 statement, officials said. “Something is clearly wrong with a system that makes it possible for consumers to run up big bills without knowing it,’’ Genachowski said. Genachowski asked St. Germain and two other cellphone customers to tell their stories during a luncheon yesterday showcasing the FCC’s efforts to regulate cellphone billing. Kerfye Pierre, a 27-year-old Maryland woman, said she received a $30,000 bill from T-Mobile for texting and e-mailing in Haiti after the earthquake. And Alexander Cullison, a 59-year-old retired doctor, said he received a $400 bill from Sprint after his son went over his monthly limit of 250 text messages. Consumer advocates have said that confusion among cellphone customers increased this year when wireless companies began charging customers per downloaded megabyte or the volume of text messages, services that used to be offered for a flat monthly fee. FCC officials, with the backing of consumer groups such as Consumers Union, the publisher of Consumer Reports, and the National Consumer League, have said billing problems appear to be growing, and that many companies appear to benefit from the confusion. Megan Woolhouse can be reached at mwoolhouse@globe.com. © Copyright 2010 Globe Newspaper Company.